The city of Berne, the capital of Switzerland, was founded in the twelfth century and developed over the centuries with a consistent and coherent planning concept. The Old City includes fifteenth century arcades and sixteenth century fountains, and though much of it was restored in the eighteenth century, it has retained its original character. Successive periods of expansion kept the imprint of the original design. It is a positive example of a medieval city adapted to fulfill functions complex—as a national capital city—and modern. The city's economy revolves around its governmental functions. It is also headquarters of the international postal, telegraph, railway, and copyright unions. It is an important market for agricultural produce and a busy rail junction. The manufacture of printing products, chocolate, machinery, electrical equipment, and chemical and pharmaceutical products are among its industries. While it serves as capital city, it is not the largest city but with a population nearing just 130,000, is out-populated by Zürich, Geneva, Basel, and Lausanne. A charming city, it lies along a narrow loop of the Aare River and consists of cobblestone streets and sandstone arcaded buildings. The surrounding hills are wooded, as are the steep river banks. Peaks of the Alps fill the horizon. Berne lies in the Swiss plateau section of the Canton of Berne, somewhat west of the center of Switzerland, and 12 miles (20km) north of the Swiss Alps. The surrounding landscape was formed by glaciers in the last ice age. The two nearest mountains are the Gurten, with a height of 2814 feet (858 meters), and the Bantiger, with a height of 3106 feet (947 meters). Berne has a temperate climate, with cold, cloudy, rainy/snowy winters averaging 28.4°F (-2°C) in January, and cool to warm, cloudy, humid, occasionally showery summers, averaging 62.6°F (17°C) in July. Total annual precipitation is 39.5 inches (1005 mm). The city was originally built on a mountain surrounded by the River Aar but outgrew the natural boundaries of the river in the 19th century. Three bridges were built to allow the city to grow beyond the river: Nydeggbrücke at the east end in 1844, Kirchenfeldbrücke to the south in 1883, and Kornhausbrücke to the north in 1898. The city is built on uneven ground, with several dozens of meters in height difference from the quarters down at the Aar (Matte, Marzili), to the higher areas (Kirchenfeld, Länggasse). Aare river in Berne. Background shows the high incline of the riverbank. Berchtold V on the Zähringer fountain in Bern. The earliest evidence of human settlement in the Aare valley dates to the Neolithic period. The earliest settlement in the area of Berne was founded on the Engehalbinsel (the Narrow Peninsula) to the north of the later city center around 300 to 200 B.C.E. A zinc plate from the La Tène culture indicates the settlement name Brenodor. This settlement was partly fortified in the second century B.C.E., and is thought to have been one of the 12 oppida of a Celtic tribe known as the Helvetii, mentioned by Caesar. After the Roman conquest of Helvetia, a small Gallo-Roman settlement—a vicus probably called Brenodunum—was re-founded at the same place, but abandoned between 165 C.E. and 211 C.E. The area was sparsely settled in the early Middle Ages, although remains of individual settlements, as well as of a ninth century church and a tenth century Burgundian fortified settlement, have been found. Duke Berchtold V of Zähringen (1160-1218) founded Berne proper in 1191, possibly attracted by the existence of an ancient castle there. According to legend, the duke vowed to name the city after the first animal he met on the hunt, which turned out to be a bear. The name Bern can stand for Bär(e)n, meaning "bears," and can refer to the city and its heraldic beast. At its founding, the city is estimated to have had up to 600 inhabitants. At that time, much of today's Switzerland was under the authority of the house of Zähringen and was considered part of southern Burgundy. The Zähringer leaders had no duchy, were styled dukes by decree of the German king, and exercised imperial power south of the Rhine. They founded or expanded numerous settlements, including Fribourg (in 1157), Berne, Burgdorf and Morat, to establish their position. The Holy Roman Emperor Frederick II made Berne an Imperial Free City in 1218, after Berthold died without an heir. The city grew to a population of 3,000 by the year 1300. During the thirteenth century, the older castle of Nydegg around which the settlement had grown was demolished, the Aare slopes were fortified, and the layout of today's Old Town was established. Initially, the Zytglogge tower marked the western boundary of the city from 1191 until 1256, when the Käfigturm took over this role until 1345, which, in turn, was then succeeded by the Christoffelturm until 1622. At the Battle of Morgarten on November 15, 1315, the Swiss defeated the Habsburg army and secured the existence of the Swiss Confederation within the Holy Roman Empire. In 1353, Berne joined the young Swiss Confederation, becoming a leading member of the new state. After a fire in 1405, Berne's original wooden buildings were gradually replaced by truss houses, and later by the sandstone buildings that characterize the Old Town. The city endured the waves of pestilence that hit Europe in the fourteenth century, and continued to grow due to immigration from the surrounding countryside. Berne invaded and conquered Aargau, the border region between Alamannia and Burgundy, in 1415, and Vaud, in the southwest, in 1536, as well as other smaller territories, thereby becoming the largest city-state north of the Alps. 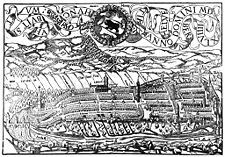 In 1528, Roman Catholics and Reformers clashed in Berne, resulting in the city becoming a Protestant stronghold. 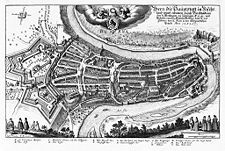 During the time of the Thirty Years' War (1618–1648) two new fortifications, the so-called big and small Schanze (entrenchment), were built to protect the peninsula, enabling Berne to grow and prosper. French troops occupied Berne in 1798, during the French Revolutionary Wars, when it was stripped of most of its territories. In 1831, the city became the capital of the Canton of Berne, and in 1848, when the Swiss confederation was replaced with a centralized federal government, Berne became the Swiss capital. Well-known anarchist Mikhail Bakunin died in Berne in 1876. Switzerland remained neutral during World War I, and was home to Russian revolutionary Vladimir Lenin, who remained there until 1917. In 1920, Switzerland joined the League of Nations, and in 1963, the Council of Europe. A number of congresses of the socialist First and Second Internationals were held in Berne, particularly during World War I. During World War II, detailed invasion plans were drawn up by the Germans, but Switzerland was never attacked. The country was able to remain independent through a combination of military deterrence, economic concessions to Germany, and good fortune. 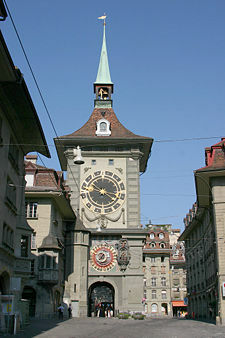 The Zytglogge clock tower is one of the city's best-known symbols. Switzerland is formally a confederation but similar in structure to a federal republic. The president is both the chief of state and head of government, representing the Federal Council, which is the formal chief of state and head of government, whose council members, rotate in one-year terms as federal president. The bicameral Federal Assembly consists of the Council of States (46 seats) and the National Council (200 seats). 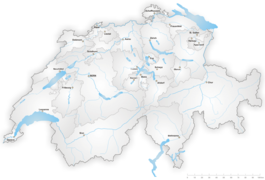 The Swiss Confederation consists of 26 cantons. The Canton of Berne is the second most populous of Switzerland's cantons. The city of Berne is the capital of the Canton of Berne. The city of Berne is governed by an 80-member legislative council (Stadtrat) and a five-member executive council (Gemeinderat). Under the system of direct democracy that prevails in Switzerland, most important issues are settled by general referendum. The office of mayor (Stadtpräsident), as a first among equals in the executive council, is mostly representative. The economy of the city of Berne revolves around its functions as the Swiss federal capital, as the headquarters of the international postal, telegraph, railway, and copyright unions, and as a market for agricultural produce. The Canton of Berne is known for cattle breeding and cheese making, most notably Emmental cheese. The area around the Lake Biel is renowned for its wine production. Tourism is the main source of income in the Bernese Oberland. The city of Berne is important for manufacturing printing products, chocolate, machinery, electrical equipment, chemical, and pharmaceutical products. Berne is well connected to other cities by several highways. Tram and bus lines connect the different parts of the city. Bern Rail Station connects the city to the national and international train network. A funicular (cable railway) leads from the Marzili quarter to the Bundeshaus. This funicular is, with a length of 347 feet (106 meters), the shortest public railway in Europe. Several Aar bridges connect the old parts of the city with the newer quarters outside of the peninsula. Berne is served by Berne Airport, located outside the city near the village of Belp. The regional airport, colloquially called Bern-Belp or Belpmoos, is connected to several Swiss and European cities. Bern, on the river Aare, with a Protestant style church tower on left. 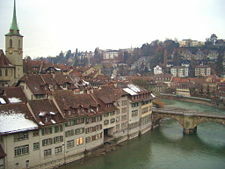 With a population of 128,041 people (the agglomeration numbered 344,000), Berne was the fifth most populous city in Switzerland (after Zürich, Geneva, Basel, and Lausanne) in 2007. The ethnic make-up of Switzerland is German 65 percent, French 18 percent, Italian 10 percent, Romansch one percent, other six percent. Most of Berne's residents speak German, or more specifically, Bernese German, which is a high-Alemannic dialect. Very few people still speak the Mattenenglisch, a language game used in the former workers' quarter of Matte, but several words have found their way into Bernese German. The majority of Bernese are Protestant, and belong to the Swiss Reformed Church, a state church, although autonomous. Berne features substantial Roman Catholic and Christian Catholic minorities, and the small Jewish community. Berne has a University, spread over several buildings in the Länggasse quarter, a University of Applied Science, and several vocational schools. Berne's old city as seen from the Garden of Roses. The Old City of Berne is the medieval city center of Berne. Built on a narrow hill surrounded on three sides by the Aare River, its compact layout has remained essentially unchanged since its construction during the twelfth to the fifteenth century. Despite a major fire in 1405, after which much of the city was rebuilt in sandstone, and substantial construction efforts in the eighteenth century, Berne's old city has retained its medieval character. Most famous in the Old City is the Zytglogge, an elaborate medieval clock tower with moving puppets. The area is home to Switzerland's tallest cathedral, the Münster, a fifteenth century town hall, as well as other churches, bridges and a large collection of Renaissance fountains. Due to about approximately two miles (6km) of arcades, the Old City boasts one of the longest covered shopping promenades in Europe. In addition to many historical buildings, the seats of the federal, cantonal and municipal government are also situated in the Old City. It is a UNESCO Cultural World Heritage Site since 1983 due to the compact and generally intact medieval core and is an excellent example of incorporating the modern world into a medieval city. Since the sixteenth century, the city has had a bear pit (the Bärengraben), which can be visited at the far end of the Nydeggbrücke. The Federal Palace (Bundeshaus), dating from 1902, which houses the national parliament, and part of the federal administration, can also be visited. Albert Einstein lived in an apartment at the Kramgasse 49, the site of the Einsteinhaus, from 1903 to 1905, the year in which the Annus Mirabilis Papers were published. The Garden of Roses (Rosengarten), from where a scenic panorama view of the medieval city core can be enjoyed, is a well-kept garden on a hill, converted into a park from a former cemetery in 1913. A set of fountains in front of the Federal Palace was inaugurated in 2004. Other sites of interest include the Bärengraben, the Gewerbeschule Bern (1937), the Eidgenössisches Archiv für Denkmalpflege, the Kirchenfeld mansion district (after 1881), the Thunplatzbrunnen, the Federal Mint building, the Federal Archives, the Swiss National Library, the Historical Museum (1894), Alpine Museum, Museum of Communication, and Natural History Museum. Theaters include: Berne Theatre, Schlachthaus-theater, Tojo Theater, the Theater on the Effinger-Street and Narrenpack Theater. Annual festivals include: Gurtenfestival, BeJazz Summer and Winter Festival, Berner Tanztage, Internationales Jazzfestival Bern, Taktlos-Festival, Queersicht film festival, and the Buskers festival. The Zibelemärit (onion market) is an annual fair held on the fourth Monday in November. As the capital of Switzerland and of Bern Canton, the city's economy revolves around its governmental functions. It is also headquarters of the international postal, telegraph, railway, and copyright unions. It is an important market for agricultural produce and a busy rail junction. The manufacture of printing products, chocolate, machinery, electrical equipment, and chemical and pharmaceutical products are among its industries. While it serves as capital city, it is not the largest city but is out-populated by Zürich, Geneva, Basel, and Lausanne. However, it claims the reputation as the most immediately charming city. 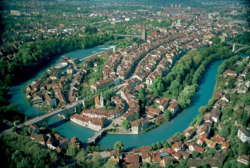 Lying along a narrow loop of the Aare River, it consists of cobblestone streets and sandstone arcaded buildings. The surrounding hills are wooded, as are the steep river banks. Peaks of the Alps fill the horizon. With a population only approaching 130,000 (2008), it is a small town with an inviting ambiance. Its Old City section has retained its medieval character. While important to the nation as the location of its capital, this relatively small city offers a pleasant charm—an important feature to both families and individuals seeking an enjoyable environment in which to live. Panoramic view of the city. Fahrni, Dieter. 2003. An Outline History of Switzerland. From the Origins to the Present Day. Zurich: Pro Helvetia. ISBN 3908102618. Encyclopaedia Britannica. Berne. Retrieved August 2, 2008. Schelbert, Leo. 2000. Switzerland Under Siege 1939-1945 a Neutral Nation's Struggle for Survival. Rockport, ME: Picton Press. ISBN 0897254147. World Fact Book. Switzerland. Retrieved August 2, 2008. All links retrieved June 3, 2016. This page was last modified on 3 June 2016, at 16:24.